Category Archives: SEND YOUR BLOGS NOW! Bringing you various topics ‘out and about’ our alumni community and as shared with us by some budding alumni writers. We welcome every alumna/ alumnus who wants to contribute articles that will interest our alumni community and fit our editorial lineup. We give promising alumni who have a knack for good pictures the opportunity to share their awesome images with a bigger audience right here in our alumni community. We have friends and experts who can answer your questions and will give advice on matters related to personality development, health and wellness, relationships or simply enjoying life? We will also listen to anything you have to say. Suggestions, feedbacks, opinions, etc. Filed under SEND YOUR BLOGS NOW! December is the season for parties, parties and more parties. We have to expect that when Christmas season comes, all are raring to go out and enjoy some social events and gatherings. May it be with the circles of friends, family or even frenemies. Providentially, reconciliation is also in the air this very time of the year. Dili maayo ang magdumot ug labing dili maayo ang mga nakasimangot sa pasko ug bag-ong tuig! As Christmas is well thought-out as the season of joy and forgiveness, we expect that most of us will also start assessing some unfinished business we have with other people and for us to have a good lead in the year 2011. We need to begin a new year with radiant spirits and blissful hearts (make it a part of your resolution guys). Let us put behind all the troubles we have had for this year and let’s move forward for the good of our brothers and sisters in Borbon for 2011. Those living in the city or in other countries may have more than their social and cultural platters full with a plethora of activities taking place there. But mind you, we also have plenty of activities to look forward to in the localities of Borbon. In school alone (at BNHS), we’re pretty sure that when the calendar reveals the last 3 letters of the month, to read as ‘ber’, school affairs have already been lined up for students to showcase their social endowments. Not to mention, the much anticipated disco at Poblacion plaza, the Christmas revelry in the neighborhoods, the merrymaking with old time friends and classmates at Lumapas or Silveria beaches. Or perhaps some have already planned a picnic at Maslog— another splendid get-away to consider among teens in Borbon nowadays. With the social activities on the upswing, it’s important to get back into shape – forsake fad diets like lechon, humba, menudo, mechado, adobo, dinuguan, hamonada and the ever sumptuous yet rich in cholesterol seafoods- the likes of pusit, lambay, prawns, etc. When attending lavish parties, don’t forget to slow down your curb for fatty foods and if your appetite really couldn’t resist it, try eating only a bit of those. You can go all out nutty this December but save more energy till January next year for the feast of our patron saint, San Sebastian the Martyr, for it will be another superfluity of local delicacies and fiesta events combined. For this opportune time, let us be the first to greet everyone in Borbon- a very merry Christmas, a very prosperous new year and an extremely jovial celebration of our town fiesta on 20th of January, 2011. That’s few more days away guys! BNHS Alumni Blog: What’s this? 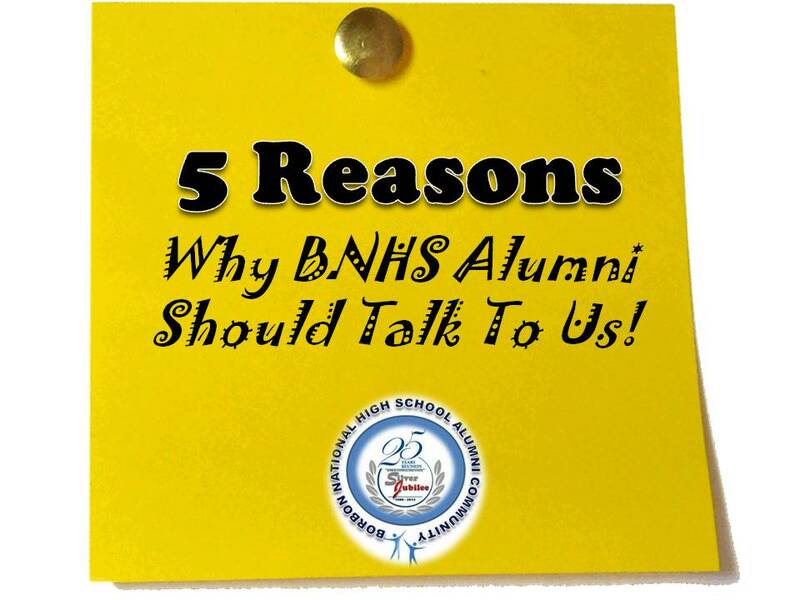 First, the BNHS Alumni Blog site is, of course, dedicated to BNHS alumni and students. We have created this to use as an interactive site for students and alumni of Borbon National High School in order to discuss school-related topics and concerns that are purely academic in nature (so politics, back off! lol). 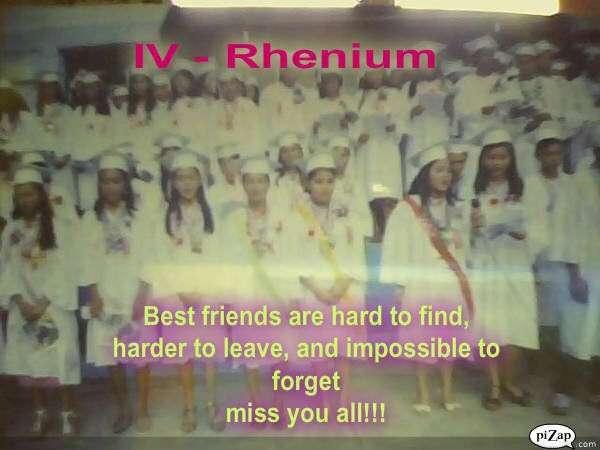 This site only carries a simple intent— to share our unique personal experiences during our four year stay at Borbon National High School and what we have become right now. As we believe that we have too much to share, thus, we hope that every student and alumna of BNHS will use this opportunity to contribute their own personal stories, comments and feedbacks or even the impact the school has given us whilst concurrently learn from each other. It’s amazing to discern how technology works nowadays and how it is possible for us this time to send one simple message to the whole world with just a click of a mouse. We have plenty of alternative web sites to choose from— facebook, twitter, multiply, friendster or any other social networking sites. While it is true that most of us are fond of getting into what’s in and what’s hot in the cyberspace, notwithstanding the remoteness of our place, we on the other hand craved to connect with our high school friends and fervently search them in the cyber world. Right through this BNHS blog site, we wish to benchmark a worthwhile assembly of BNHS graduates and students. And we are hoping that each one of us will share distinctive stories with energy and enthusiasm; and hopefully, we’ll maintain the same enthusiasm as the days, months or years pass by. Note: For students of BNHS at present, we understand that you are still on the training grounds of learning. You may also use this site to discuss or share school related queries and concerns such as research topics, problem about love (lol), seek advice or anything with sense and maybe some alumni out there can help. Just define your questions that will adhere only to the very intent mentioned above, because we want to be subjective with every topic being discussed here and for us not to be labeled as something we’re not. On a lighter note, let’s try to refresh our understanding about blog. But what is a blog anyway? According to Wikipedia, a blog (a blend of the term web log) is a type of website or part of a website. Blogs are usually maintained by an individual or group of individuals with regular entries of commentary, descriptions of events, or other material such as graphics or video. Entries are commonly displayed in reverse-chronological order. Blog can also be used as a verb, meaning to maintain or add content to a blog. Most blogs are interactive, allowing visitors to leave comments and even message each other via widgets on the blogs and it is this interactivity that distinguishes them from other static websites. We would love to learn from you too. So, pop that comment below and let’s talk about it. Welcome to BNHS blog site. If you wish to post your blogs about our school, teachers, fellow students or any topics under the heat of the sun, please feel free to do so by sending it to us and we will be more than happy to find a special place of your blogs here, at our alumni blog site.